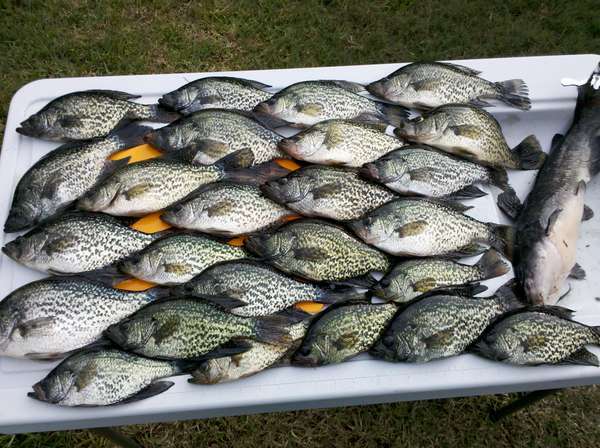 This has been a banner year (at least for me) for the black crappie. Just curious if anyone else has had especially good luck with them this year. Today I only kept 19. The pic is from just before new years. I hit my limit of 25 in about 3 hrs. It's been touch to balance fishing, sawing, geocaching and working on my masters. Good looking mess of fish,That would be some fine eating I love them. Those are the best eating; scale, gut, cut off the heads and fry in corn meal until crispy. The dorsal fins pull out, eat the crispy tail and eat like corn on the cob. Makes my mouth water just thinking about them. I filet just about everything. The next batch, I may scale and then filet so I can eat that tasty crispy skin. It's just way more trouble. Must be about 62 years ago when my Grandfather took me out one summer and taught me how to fish for those same fish. And I remember cooked the same way too, with cornmeal. Also first time I ever ate roe fixed that way too. Just leave the tail on so it is crispy, that's the first bite. Link to all chainsaw specks? Page created in 1.094 seconds with 39 queries.